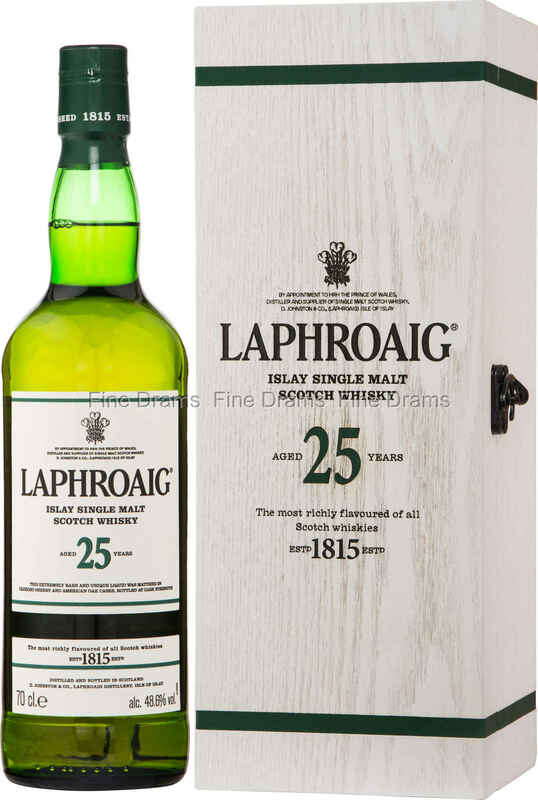 Laphroaig’s 25 Year Old release is always a much anticipated and coveted bottling, and this 2016 offering deserves the hype. An extraordinary whisky from the old Islay powerhouse, this peated dram has been aged in a mixture of first fill Oloroso sherry casks and former Bourbon barrels. This maturation has given the spirit a tremendous depth and complexity. 25 years in the barrel allows this whisky to fully develop a deep, oak-led character, whilst also tempering the intensity of the peat considerably. This outstanding dram announces itself with a huge punch of dried fruit sherry sweetness – think prunes, dried cherries and jammy raspberries. This is followed by an iodine-tinged peat waft, with notes of vanilla, peach, and apricot. Crisp flavours of vanilla, mineral, tobacco smoke and woodspice appear after a while. Bottled at a cask strength of 48.6% ABV and without chill filtration, this ensures that the drinker gets to enjoy the full benefits of 25 years of maturation. Perhaps the greatest example of the old Islay style, this whisky represents perfect balance between peat and age, sherry and bourbon, spirit and oak. A truly superb whisky. Laphroaig 25 is beautifully presented in a wooden presentation box, complete with clasp closure.